$99USD What is a module? Ratings and reviews are collected through the Feedback form; ratings submitted with a verified email address matched to a purchaser are included in the rating for each product and the aggregated rating for all models, and reviews are published if the reviewer wishes to share their feedback publicly. Ratings are new - launched July 2018 - so not all products have enough ratings to be displayed yet. Module, downloadable immediately. One-time purchase, updates are free. Free email customer support. Plus the Standard Model, pre-integrated with the module. Integrating a module with the Standard Model takes less than one minute, so the Model can always be purchased separately. If you know you want the full capabilities of the module and the Standard Model, and want to purchase the module pre-integrated with the Standard Model, purchase this option. Plus the Video Course (save $49). The course is targeted for beginners to financial modeling that want to learn the concepts of how to create a financial model. The video course is not a “how-to” for the model, but a deep dive into the fundamentals of building a financial model for startups in general. The course is viewed on this site by creating an account after purchase, preview here. Course is sold for $99 on its own, only $50 in package with a model. Plus the Get Started support option. 1 Hour of assistance in completing the model, customization and review. Focus is on structuring and adjusting inputs for your business, and refining unit economics, cost budget, financial statements, and financing strategy. Can be purchased separately later. Additional customization may be necessary depending on your business; to be determined and billed separately. A module creates a detailed growth and revenue forecast for a specific type of business, focusing on growth channels, revenues, cost of sales, and other components that are key to the type of business. A module can be used on it’s own, or can extend the Standard Financial Model by adding additional detail to the revenue forecasts for specific types of businesses. A module does not have the core functions of the Standard Model - financial statements, summaries, reports, operating expenses, valuation, cap table, and more - but can be easily combined with the Standard Model to create an full financial model. Modules are built to be easy to integrate and add on to the Standard Model, and offer an easy-to-use upgrade path; start with the Standard Model and build a full forecast, and if necessary, later add on a module to expand on the level of detail in the revenue forecast. No need to rebuild your model later on, use modules to create a model with more detail when it’s meaningful for business decision making. This is a summary of terms and conditions in using this site; by using or accessing our Website and/or placing any order(s), you agree to be legally bound by these terms and conditions (in full here). The financial models and educational courses have been designed for your use to estimate and project your financials for your business idea. They include some benchmark data and structure to help you create your projections, but you will need to modify the assumptions and structure to fit your business. We do not accept any liability for damages in using the financial models. We provide information designed to educate and inform entrepreneurs. We and our Products are not intended to provide legal, tax or financial advice. We are not financial planners, brokers or tax advisors. The Product is intended only to assist you in your financial organization and decision-making and is broad in scope. Your financial situation is unique, and any information and advice obtained through the Product may not be appropriate for your situation. Accordingly, before making any final decisions or implementing any financial strategy, you should consider obtaining additional information and advice from your accountant or other financial advisers who are fully aware of your individual situation. All prices quoted are in US Dollars and are inclusive of tax (as applicable), except for VAT. VAT is charged applicable to your location and is additional to the listed price. The price does not include any delivery cost. Prices may change at any time, but will not affect orders which have already been shipped. Coupons are only applicable at the time of purchase and cannot be applied retroactively. Our products are offered for sale subject to availability and our acceptance of your order, which we reserve the right to reject without reason. However, we will inform you as soon as possible if the products you have ordered are not available or if your order has not been accepted, and a full refund will be given for orders which are rejected. We may from time to time issue gift or promotional codes relating to the purchase of the products. These gift or promotional codes will only be available on the terms specified at the time of issue. Should you attempt to make an order for products using a gift or promotional code issued to another individual and/or for purposes other than those for which it was granted, we shall be entitled to reject such order. A refund will be given for all rejected orders. When you pay for a financial model, you will be given the option to download the model immediately, and will receive an email to the email address you supplied in the purchase process with the financial model attached. Orders normally ship immediately, if you do not receive the email with the financial model, please check your spam folders. If for some reason you have not received your product, please let us know. Email us at: hello@foresight.is. We do not offer refunds or returns (here’s why). In select cases, we exchanges to replace a model you purchased for a model up to the same price. If you have any question about the applicability of the models for your business or questions about the models, email us before purchase at hello@foresight.is. Subject to your compliance with these Terms, you are hereby granted a non-exclusive, limited, non-transferable, revocable license to use the Product as we intend for them to be used. You are licensed to keep, for your own personal records, electronic or physical copies of documents you have created from the Product. You may not copy the content of our forms or agreements for use or sale. Any rights not expressly granted in these Terms are reserved by us. Resale or unauthorized distribution of materials downloaded from the website is strictly prohibited. Use of these materials is for your personal or business use. Any resale or redistribution of our materials requires express written consent from us. We retain all right, title and interest in and to the products, including, without limitation, software, images, text, graphics, illustrations, logos, service marks, copyrights, photographs, videos, music, spreadsheet methods, and all related intellectual property rights. Except as otherwise provided in this agreement, you may not, and may not permit others to: (i) reproduce, modify, translate, enhance, decompile, disassemble, reverse engineer or create derivative works of any of our Product; (ii) sell, license, sublicense, rent, lease, distribute, copy, publicly display, publish, adapt or edit any of our Product; or (iii) circumvent or disable any security or technological features of our Product. The design, text, graphics, selection and arrangement thereof and services and the legal forms, documents, guidance and all other content found on our website are the copyright © of us. All rights reserved. We are always seeking to deliver an excellent Product to you. However, from time to time, some of the information, software, products, and services made available through the website may include inaccuracies or typographical errors. Thus information received from us should not be relied upon for personal, medical, legal, or financial decisions. You should consult an appropriate professional for specific advice tailored to your situation. In short, your use of our Services is at your own risk. TO THE FULLEST EXTENT PERMITTED BY LAW, WE AND OUR AFFILIATES, SUPPLIERS AND DISTRIBUTORS MAKE NO WARRANTIES, EITHER EXPRESS OR IMPLIED, ABOUT THE SERVICES. THE SERVICES ARE PROVIDED “AS IS.” WE ALSO DISCLAIM ANY WARRANTIES OF MERCHANTABILITY, FITNESS FOR A PARTICULAR PURPOSE AND NON-INFRINGEMENT. INFORMATION AND OPINIONS RECEIVED VIA THE WEBSITE SHOULD NOT BE RELIED UPON FOR PERSONAL, MEDICAL, LEGAL OR FINANCIAL DECISIONS AND YOU SHOULD CONSULT AN APPROPRIATE PROFESSIONAL FOR SPECIFIC ADVICE TAILORED TO YOUR SITUATION. TO THE FULLEST EXTENT PERMITTED BY LAW, IN NO EVENT WILL WE, OUR AFFILIATES, SUPPLIERS OR DISTRIBUTORS BE LIABLE FOR ANY INDIRECT, SPECIAL, INCIDENTAL, PUNITIVE, EXEMPLARY OR CONSEQUENTIAL DAMAGES OR ANY LOSS OF USE, DATA, BUSINESS, OR PROFITS, REGARDLESS OF LEGAL THEORY, WHETHER OR NOT WE HAVE BEEN WARNED OF THE POSSIBILITY OF SUCH DAMAGES, AND EVEN IF A REMEDY FAILS OF ITS ESSENTIAL PURPOSE. OUR AGGREGATE LIABILITY FOR ALL CLAIMS RELATING TO THE SERVICES SHALL IN NO EVENT EXCEED THE GREATER OF $500 OR THE AMOUNT PAID BY YOU TO US FOR THE 12 MONTHS PRECEEDING THE SERVICES IN QUESTION. You shall defend, indemnify and hold us and our officers, directors, shareholders, and employees, harmless from and against all claims, suits, proceedings, losses, liabilities, and expenses, whether in tort, contract, or otherwise, that arise out of or relate, including but not limited to attorneys fees, in whole or in part arising out of or attributable to any breach of this Agreement or any activity by you in relation to the Sites or your use of the Product. Purchases and Downloads. We use Gumroad to process purchases, downloads, and transactions, including taking payment for the products sold through this site. All transactions are processed through Gumroad, and no payment details are stored by us. All of your payment information is tokenized and encrypted in a PCI compliant ecosystem through Gumroad, and you can learn more what that means here. We also use Gumroad to send emails, including your receipts and invoices, and updates on your product. Gumroad stores our customer lists, and our records of who has downloaded or purchased which products. Any information Gumroad collects when you visit my site is not available to me, and you can contact Gumroad to view or delete any information that they have. You can contact me to request details of the information I have available to me about you on Gumroad, which is limited to the information you provided at download or purchase. You are not required to create an account to purchase, I am required to store records of your transaction to be able to offer you ongoing downloads of the products you purchase. Website accounts. We use this site to deliver a video course, and require creation of a user account to view the videos which are embedded on pages that are available only to logged-in users. We store limited information, including your name, user name, email address, and password that you submit upon creation of an account. Your passwords are encrypted and cannot be accessed by us. Cookies are used to track if you are currently logged in so that you do not have to log in every time you view a new page. Your account is required to view the video course, but you may delete your account at any time simply by contacting us and requesting account deletion. Mailing list and sending newsletters. We use Mailchimp to collect email addresses through the signup forms on this site, and if you submit your email address on this site, it will be added to my list to send you emails from time to time. We also use Mailchimp to deliver transactional welcome emails after purchases. We do not sell or share your email addresses or any personal information about you. You may unsubscribe or edit your profile (link in any email, or contact me anytime. Analytics. I use Google Analytics through Google Tag Manager to understand the usage of this website. This data is anonymized and I cannot access or use this information in any personally-identifiable way. Here’s how you can Opt Out from Google Analytics. 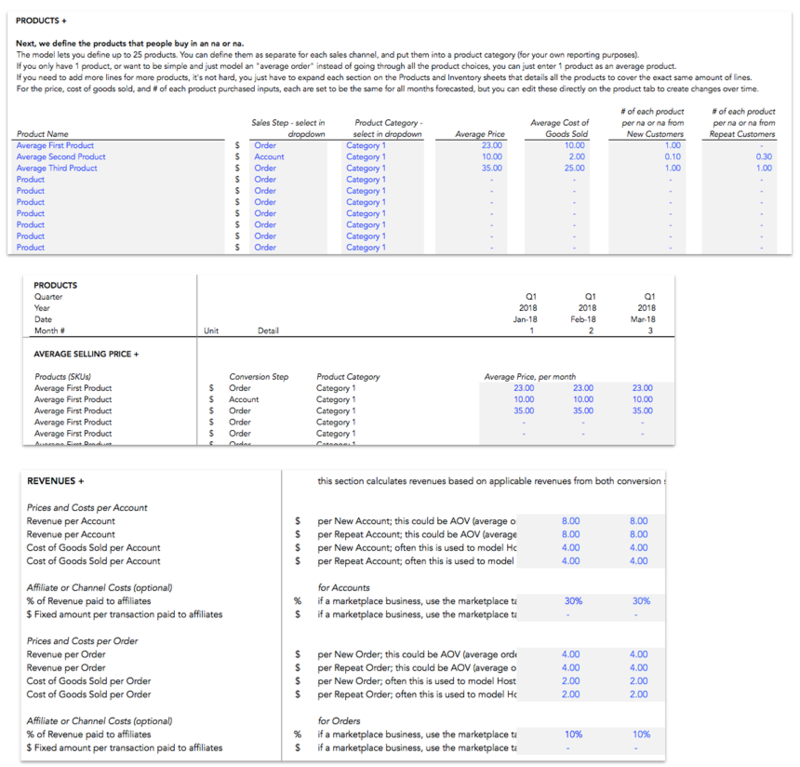 Five year financial model template to forecast sales, revenues, cost of sales, and (optionally) inventory levels for ecommerce, retail, and transaction-revenue businesses. Combines with the Standard Model to add prebuilt three statements - consolidated income statement, balance sheet, and statement of cash flows - and key charts, summaries, metrics, and funding forecasts. Used by A, B, and post-funding stage companies. Unlocked - use in Excel or Google Sheets, edit anything - last updated in August 2018. Financial model template for ecommerce and retail businesses looking to forecast to forecast revenues and cost of sales using multiple SKUs - prices, cost of sales, per order rates, inventories. Creates summaries and key reports using industry-standard metrics to help you clearly communicate your business. Made for founders, executives — CEO, CFO, COO, VP of Finance — or advisors, mentors, or consultants that need to create detailed sales and inventory forecasts for multiple products and SKUs for an idea-stage, pre-seed, seed, A, or B stage company. Standards-based, extensively tested and used by thousands of companies across a wide variety of business types, revenue models, and needs. Use in Microsoft Excel or Google Sheets; all cells and formulas are unlocked for editing and transparency, add on or edit for your specific situation. 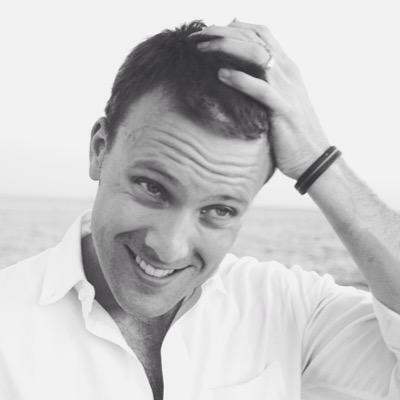 Built by a professional financial modeler with experience as an investor and running forecasting inside startups. Responsive, personal support — chat, call, or email — and available for custom services. Updates distributed to registered users for free. See details on the latest update. All sheets with monthly, quarterly and annual buildup: Edited the calculation of the first ending quarter date for all models for the quarterly summaries. Existing formula failed if the calendar year of the fiscal year was different from the calendar year of the start date. If you’re looking for help building a model, check out the Help section, and contact me if you have any questions. I’m best available Monday to Friday 9 am to 4 pm EST, and I try to personally respond as fast as I can. I created the financial models behind Foresight so early-stage entrepreneurs can spend less time on finance and more time on their products. I care about financial modeling because I believe that financial models can help us make critical business decisions even if the models themselves are not “always right”. Financial models can help even the earliest entrepreneurs if we build “minimum viable models” to focus on the decisions that matter most. of this model type from 2016 to today. is how long it takes to build a complete model, on average. Sources: internal sales data, post-purchase survey, 2017 - present. I build standards-based, rock solid financial models to solve real business problems. Here’s what’s inside the Ecommerce Module. The Ecommerce Module is built for easy integration if purchased separately, with no structural changes necessary to upgrade. Just copy in the module sheets, select the Export option the Standard’s model settings, and setup the conversion funnel. Purchase the Ecommerce Module with the Standard Model, and the models come pre-integrated. Utilizes the default growth mechanisms from the Standard Model, allowing you to model growth from paid advertising, organic, viral, and sales channels. Flexible two step conversion funnel that allows you to model the acquisitions and conversions to two different revenue streams, products, or usage situations. Dynamic labeling system allows you to define the terminology to use to describe your customers and revenue streams. Prebuilt to handle up to 25 different products or SKUs, allowing you to set different prices, cost of goods sold, per-order rates for new and repeat orders. The model uses forecasted sales to plan out inventory purchases and inventory levels on a per-product basis. Set safety stock, minimum order quantity, lead time from purchase order to inventory in stock, percentage paid on order, and days payable for inventory purchases on a per-product basis. Creates schedule of inventory purchases and calculates inventory values and cash impacts for balance sheet and statement of cash flows. After you click on “buy”, you will be able to select which option you want. The video course and Get Started may also be purchased separately later. Download immediately and anytime through the link in your email receipt. We accept credit cards, debit card, and PayPal. The transmission of your billing information is encrypted using secure socket layer technology (SSL/TLS) and will be processed by Gumroad. Foresight does not have access to your payment details (why it’s safe). VAT, if applicable, is additional. Businesses with a valid VAT number can get a VAT refund after purchase (details). You’ll get a payment receipt by email immediately after purchase. Note, you will see Gumroad, not Foresight, on your payment card or PayPal statement. Get help buying. Chat now or call 1-646-770-0052. What model do I need for an Ecommerce or transaction-style business? The Standard Financial Model is the base model for all Ecommerce and transaction-style businesses, using one “average” order to model orders, purchases, customers, and revenues. The Ecomerce Module allows you to extend the Standard Model by adding in the ability to expand that “average” order into up to 25 different SKUs or products. If you need something simpler and do not need consolidated financial statements, start with the free Sales and Inventory Tool or Wholesale Sales Tool, released in partnership with TradeGecko. Extends the Standard Model to add on up to 25 individual SKUs or products (extendable to many more). Can set prices, cost of sales, unit sales per new and repeat orders, inventory stocking levels and purchasing timelines, all on a per-SKU basis. Utilizes the existing default revenue model and acquisition forecasts, no structural changes necessary to upgrade. By default, the Standard works for ecommerce businesses by modeling 1 “average” product, order, customer. You can model your business using an “average order size” assuming all subscribers have the same monthly revenue, contract length, and churn. If you want to expand to model the components of the average, upgrade to a module, anytime. Forecast sales and inventories for up to 25 products for 3 sales channels, setting per-SKU prices, cost of sales, inventory purchasing methods, and more. Forecast a wholesale business by modeling sales of products using unique prices, cost of sales, timing, repeatability, and payment terms on a per-sale basis. Multiple models can be used to model an ecommerce, retail, or transaction-based revenue model. The Ecommerce Module offers the most detail, and combined with the Standard Model, can forecast consolidated financial statements and full financial reporting. The two free tools, released in partnership with TradeGecko, offer the ability to forecast sales, inventories, and basic financials for ecommerce or wholesale businesses. Is this the right model for me? The forecast tools are all free tools that are built to handle specific kinds of forecasting, from wholesale sales and cash flow, or per-channel digital marketing and sales forecasts, to sales and inventories for ecommerce companies. They are not intended to be full financial models, but used appropriately can help you make important financial decisions about your business. The base financial models are built to help an entrepreneur create financial projections for their business. The models provide an increasing amount of prebuilt detail and structure, from the Runway & Cash Budget Tool - the simplest - to the SaaS/Ecommerce/Services Models - the most complex - to help you find the right level of detail and structure you need in your forecasts. The Standard is the best option for most businesses. The financial core contains all the details and reports necessary to build and present your financial model to executives and investors and make significant business decisions. The growth and revenue forecasts are prebuilt using the default revenue model, but the model also offers the Bring Your Own Model functionality to let use build or use your own revenue model with the financial core in the Standard. If you need less detail - for example, if you’re an entrepreneur just getting started - then use the Runway & Cash Budget Tool (it’s free) or the Starter Model if you’re looking for the simplest, “Minimum Viable Model” for an entrepreneur to use to raise capital. If you need more detail - for example, if you’re a SaaS, Ecommerce, or Services business and you need to model out lots of different subscription plans, SKUs, or projects - then the SaaS, Ecommerce, or Services modules / models would be the right fit. The Standard handles 1 “average” subscription, order, or project, and in most cases it’s still the right choice, but if you have a more evolved business and you need to detail each different plan, SKU or project that you offer, then you’ll want the more advanced models. My general rule: start with the model that has less detail - just enough to accomplish what you need - and then either build in what you need or upgrade to a more advanced model with more features prebuilt. It’s usually easier and cheaper for you. If you have questions, just email me at hello@foresight.is or call +1 646.770.0052 if it’s urgent. How do I use the models? Foresight’s models are Microsoft Excel™ files, and they are available for download immediately after purchase. You can also re-download them at any time in the future through your account on this site, and new versions are distributed to you by email for free. The best way to use the templates is to first create a copy of the file you downloaded, rename it to something that makes sense to you, then open up the file in Excel or Google Sheets™, and start to familiarize yourself with how the model is structured. There are also a lot of explainers and how-to’s on this site under the Help section where I answer the most important and common questions people ask. But the models are extensively documented throughout, with notes and explainers on almost every line noting what the calculation is doing and it’s intent. The Outline sheet provides an overview of each sheet and a visual description of how the information is separated in the model and how the sheets flow together. 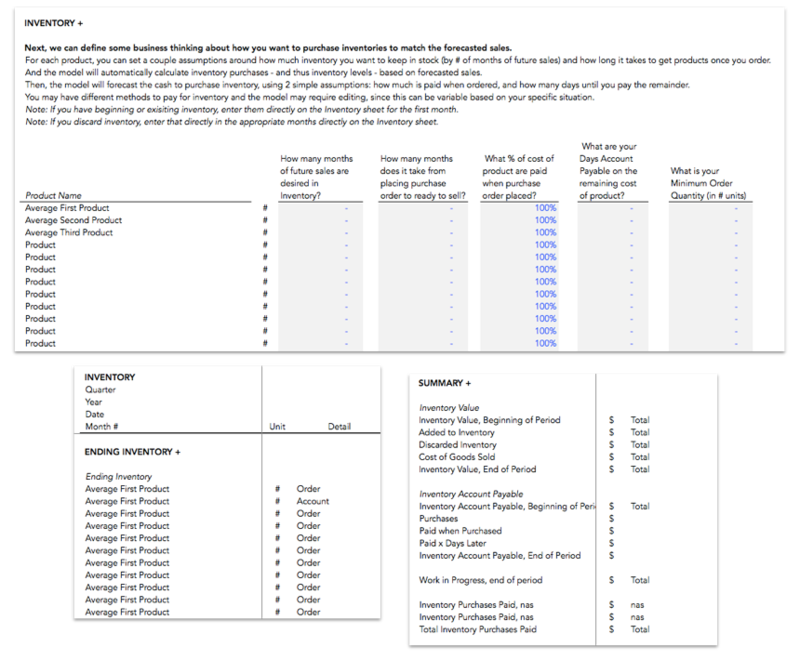 Then, start with the Get Started sheet(s) with the most important assumptions, and start filling in the inputs, which are clearly labeled. Then I typically start with modeling the operating costs to create a cost budget and an idea of predicted overhead expenses. Next comes the revenues; with the Standard Model, start with the Get Started - Revenue Model sheet and use the labels to define the terminology you want to use in the default revenue model, then go through the inputs around growth channels, conversion and adoption, prices, and cost of sales. With other models, the structures are different, but the basic idea is the same. By now, you’ll have a basic forecast, and now it comes down to looking at the Summary and Key Reports sheet(s) to see if the projections make sense: net income, top-line growth, margins, etc. And refining and iterating on the inputs until you get to a final result that makes sense for your business and your industry. Foresight’s models are Microsoft Excel™ files, and they are available for download immediately after purchase. I recommend using Excel or Google Sheets™ for financial modeling, both in general and for Foresight templates specifically. In practice, I use Excel to build and edit models, and Google Sheets to share or collaborate with users. Excel is usually a faster platform for building models, but Sheets can be easier for sharing models with people. Foresight’s models can be used in both Excel and Google Sheets interchangeably; simply upload the Microsoft Excel model template from Foresight into Google Sheets, and everything will work fine. How long will it take to build a model? It generally takes about an hour to go through the setup on the one (or two) Get Started sheets, the Revenue Model (Standard Model only), and input the operating expenses and hiring plan on the Costs sheet. Once you have a first draft of the model with the basic information, I find it takes another hour to adjust the inputs to create a set of forecasts that makes sense for your business, meaning the growth in revenues, gross margins, and net profit margins “make sense”. If you are inputting past operational or financial data and creating rolling forecasts, or have a more complex business, it can take more time to get the added data into the model. If you are adding in a revenue model you’ve already built through the Bring Your Own Model functionality, the integration of the new revenue model is usually five to ten minutes. If you are creating your own revenue model from scratch, obviously the amount of time it takes is completely dependent on the complexity of your business, the level of detail you are modeling, and your own skills at spreadsheets and financial modeling. Can I edit the models? Of course! All formulas, cells and sheets are completely open, so you can edit anything to your liking. Each row on every sheet has a note about what that row’s calculations are trying to do, and many of the components are explained in the help files, so that you can see how I did it - and help you figure out how to change it to your liking. The Standard Model is a fully modular model that seperates the financial core - financial statements, operating costs, hiring plan, cap table, valuation, and actuals reporting - from the growth and revenue projections, allowing you to easily change or replace the default revenue model built into the Standard Model. The modules extend the detail and functionality of the Standard Model by adding in additional detail or advanced methods for forecasting growth and revenues for specific business types. For example, while the Standard handles 1 average “order”, or “plan”, or customer, the SaaS handles by default up to 8 different plans (and can be extended to many more), and the Ecommerce handles by default up to 25 SKUs and two sales channels (and can be extended to many more). The problem with financial model templates has always been that they do some things you need, but not everything, and it can be incredibly hard to modify them to do what you want. One of the reasons for that is because modeling the revenues for a business - the sales methodologies, the growth engine, what is sold and how it’s sold, etc. - can be incredibly specific to each business, and it’s very hard to build a model that can work for a wide variety of businesses. That’s why I’ve worked to build a modular model - a standardized financial core with an easy methodology to integrate with any revenue forecast - to help solve the problem with financial model templates, and to make it as easy as possible for you to use a template and minimize the amount of time you have to spend to make it work for you. The modules are built to make the integration process seamless and fast. You can purchase them at the same time as the Standard Model and thus purchase a pre-integrated model, or you can purchase them later once you’ve determined you need or can make use of the additional detail and functionality. Integration is as simple as copying the sheets of the module into your Standard Model, and then switching a dropdown selection on the Get Started sheet. Painless, and should take less than one minute. Questions, ask anytime. How often are the models updated? The models are updated no more than they have to, as changes can be disruptive to users. All purchasers get updates of new versions automatically by email, and the models come with Changelog sheets that describe the changes that happen in each model version. Most of the time the changes are new features that are optional for users to add. Yes! You can email me anytime and I’ll try to respond as fast as I can. I’ve also spent a lot of time to build out the written and video documentation here on this site through the Help section, but I’m always happy to help. People say I provide good support, for what it’s worth. Do you build custom models? Yes. I work with startups and investment funds, assisting with financial models for fundraising, capital planning, and market development strategy. I have experience from both sides of the table as a venture capitalist and a part-time CFO, and I’ve worked with thousands of companies throughout my career. Complex cap table and waterfall models to help entrepreneurs and investors understand how the proceeds from transactions will be distributed. I’ve built hundreds of custom models for business planning and financial analysis I’m always happy to talk about what you want to accomplish. Contact me at hello@foresight.is or +1 646.770.0052. Can you help me with a non-Foresight model? Yes! I’m happy to take a look at your existing model and offer advice on how you can improve on it, or help you add in features or edits you need. I usually focus on how to make models more flexible, accurate, structured, and transparent. Contact me at hello@foresight.is. Do you give workshops for entrepreneurs? Yes! I’ve been a mentor at TechStars, ERA (Entrepreneur’s Roundtable Accelerator), AlphaLab, The Brandery, Launch Pad, and more accelerators, and I’ve worked with startups on product strategy, market strategy, financial projections, pitching, and fundraising. I love to teach entrepreneurs how to think about business strategy using the analytical processes that financial modeling builds, and I do in-person and virtual lectures, seminars, and one-day workshops on financial modeling for startups. Do you offer bulk licenses? Yes. For incubators, accelerators, and universities looking to purchase a model for a group of startups or entrepreneurs, bulk license purchasing is available at a discount. A license covers one model, and can be used for any of the startup financial models available (venture capital model is not available for bulk licensing). Can I upgrade after purchasing? Yes. If you find that you need more detail or structure from a more advanced model, you can apply your purchase towards a more advanced model. The structures are fairly consistent so it’s usually fairly easy to take any inputs from your existing Foresight model and use it in a more advanced model. It’s a manual process for me to process an upgrade purchase, and I like to talk to you to make sure the more advanced model will be helpful for what you want to accomplish, so simply email me at hello@foresight.is to learn more. Sorry, but no. (Here’s why.) If you have any questions about the applicability of the models for your business or questions about the models, email me before purchase at hello@foresight.is so we can chat or schedule a demo. After purchase, I generally offer exchanges, upgrades and downgrades to help you find the model that is the right fit for you. In all cases, just contact me. Yes. We accept credit cards, debit card, and PayPal, and payments are handled by Gumroad. All transactions are TLS / SSL secured and no payment details are stored by Foresight (see here to understand the details behind our transaction provider, their security and how they never store payment details). You’ll get a payment receipt by email immediately after purchase, and you can generate an official invoice through that receipt. Note, you will see Gumroad, not Foresight, on your credit card or PayPal statement. Why am I charged VAT? If applicable, VAT is additional to the listed product prices. EU law requires businesses, even US-based businesses, to charge VAT for digital goods sold to EU customers. Businesses with a valid VAT number issued by any Member State of the EU can get a VAT refund after purchase, simply follow my transaction provider’s process for getting a VAT refund. Let’s start building your model. 96% of users say Foresight models help them in fundraising, business planning, and understanding their key metrics. I’m available for free email support and questions anytime, and I work with many entrepreneurs and investors on customizing the templates. In 5 free lessons I share the basics of how to model growth, revenues, costs, build financial statements, and summarize your forecasts for business planning and fundraising. You agree for Foresight to contact you by email with advice on financial modeling and promotional offers. Your data is stored securely and I never pass it on to third parties. Here’s how I use your data. © 2018 Unstructured Ventures, LLC. Made with in Pittsburgh, PA.
Foresight builds standards-based, rock-solid financial models for forecasting and fundraising. We’ll do a 15 minute screenshare or call to talk about your needs and walk you through the Ecommerce Module (or others) to help figure out the right solution for you.